New Delhi,29 Apr:Defence Minister Shri A K Antony handed over special scooters to 30 disabled soldiers at a function here today. The user-friendly scooter, supported by two auxiliary wheels in the rear, are an improvement over the cumbersome motorized tri-cycles. The scooters have been fully funded by the Kendriya Sainik Board. Speaking on the occasion Shri Antony said that the amount of financial assistance under the Raksha Mantri’s Discretionary Fund (RMDF) has been doubled. A large number of new schemes including old age pension, widow marriage, assistance to orphaned daughters and to Ex-Servicemen with 100% disability have been introduced, he added. Shri Antony said that the Government is making efforts to revitalize the Sainik Boards by filling up vacant posts and holding regular board meetings. 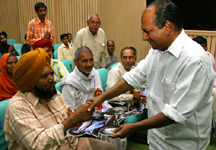 To the applause of the gathering, the Defence Minister announced that the Department of Ex-Servicemen Welfare has rehabilitated 44,000 ex-servicemen, exceeding the target of 40,000 placements in Public and Private sector. He assured the ex-servicemen that problems with the Ex-Servicemen Contributory Health Scheme (ECHS) are being sorted out to benefit a large number of ex-servicemen living in the remote hilly regions. Addressing the gathering the Minister of State for Defence Dr M M Pallam Raju said efforts are on to explore gainful employment avenues for the ex-servicemen in jobs like toll plazas, retail, tourist police and forest guards. He said the diploma courses in Management introduced by the reputed Indian Institutes of Management (IIMs) for superannuating officers have been a huge success and the placement has been cent percent. The Secretary Ex-Servicemen Welfare Ms. Deepa Jain Singh, Director General Resettlement Maj. Gen. S G Chatterji and Commodore K C Choudhury, Secretary Kendriya Sainik Board were also present at the function. The modified scooters, a vast improvement over the motorized tri-cycles, were approved during the 10th meeting of the Managing Committee of the Armed Forces Flag Day Fund held on June 08, 2007 under the Chairmanship of the Defence Minister. This replaced the motorized tri-cycle manufactured by the 515 Army Base Workshop, Bangalore. Over 100 motorised tri-cycles manufactured by the base workshop have been distributed to the disabled ex-servicemen since 1990 .